It's a bolt from the blue with the rare gemstone that took the jewelry world by storm! Lightning struck the day they discovered Tanzanite. A bolt from the sky set the foothills of Mount Kilimanjaro ablaze, revealing the sparkling violet-blue of Tanzanite below the surface. And this was no ordinary gemstone. Henry Platt, past president and chairman of Tiffany & Company called Tanzanite, "The most important gemstone discovery in over 2,000 years." Lightning also struck the day you met her. Every star aligned to create the brilliant flash that lit up your heart and changed your life forever. 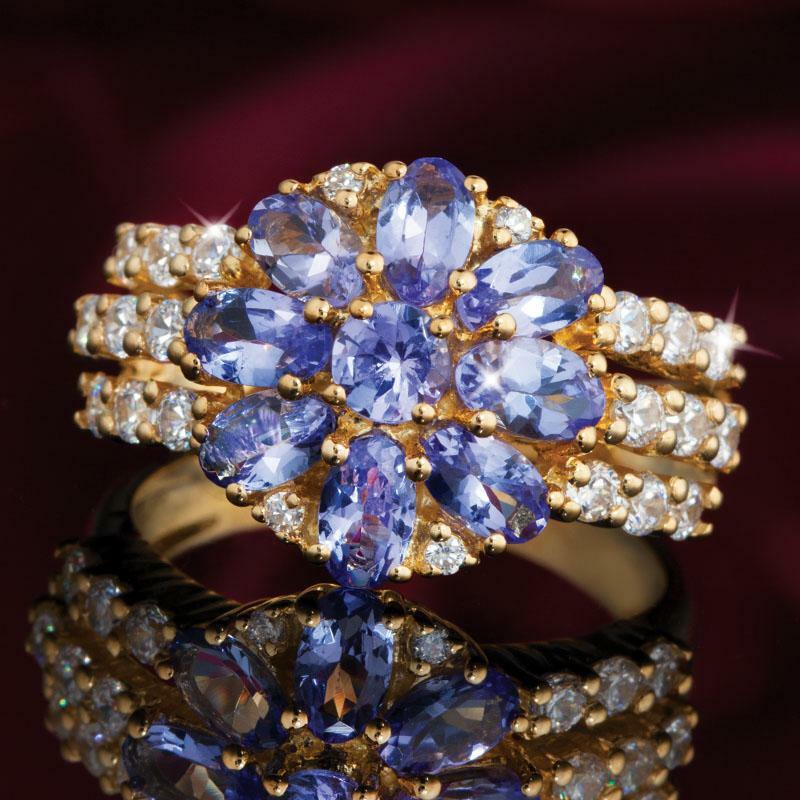 With the Lovestruck Tanzanite Ring you can celebrate your own lucky lightning strike with the gemstone that took the jewelry business by storm. Nine tanzanite gemstones, weighing over two carats total. These violet-blue beauties are surrounded with 22 lab-created DiamondAura® for a bonus flash of brilliance. You've been lucky enough for lightning to strike twice, but there will not be a third time. "Experts estimate that our tanzanite deposits will have run out in 30 years," says prominent mining company TanzaniteOne. With our industry contacts we've been able to secure a limited supply and offer the Lovestruck Tanzanite Ring at this exclusive price! But once the world's supply of tanzanite is gone, it's gone for good, and we'll all be left staring up at the sky, longing for another bolt from the blue. Your satisfaction is 100% guaranteed. With over 4,000 sold, we currently have less than 1,400 in stock! Experience the rare beauty of the Lovestruck Tanzanite Ring for two months. If it fails to create sparks, simply send it back within 60 days for a complete refund of the sale price. We want you head over heels.